This letter was written by G.W. Lowry to Governor George Hodges. 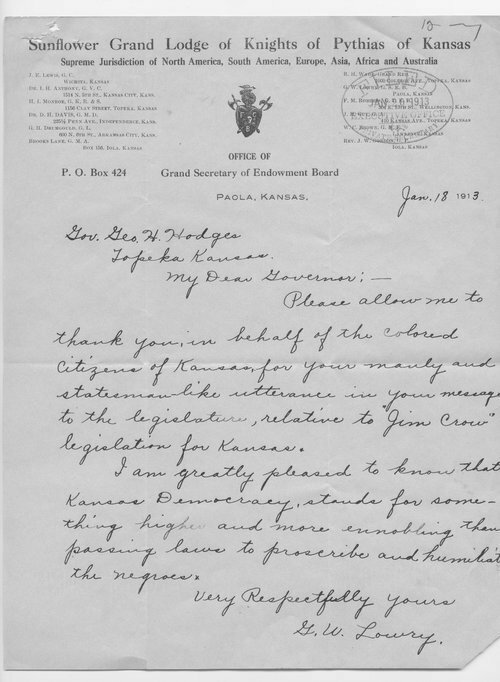 Lowry thanked Governor Hodges for a speech he had recently made to the Kansas House of Representatives discouraging the passage of a Jim Crow law. Lowry was pleased to learn that the Governor opposed the law and that true democracy could still be found in Kansas. This particular Jim Crow law did not pass in Kansas. Many black Kansans at this time were experiencing Jim Crow laws by segregated elementary schools in first class cities and having to pay a poll tax at voting booths. Up until the Civil Rights Movement of the 1960s few if any changes were made to Jim Crow laws nationwide, especially in the South.